Heavenly Father, in the mist of our sufferings for the sake of Christ grant us grace to follow the example of the first martyr, Stephen, that we also may look to the One who suffered and was crucified on our behalf and pray for those who do us wrong; through Jesus Christ, our Lord, who lives and reigns with You and the Holy Spirit, one God, now and forever. Amen. Introduction: St. Stephen, “a man full of faith and of the Holy Spirit” (Acts 6:5), was one of the Church’s first seven deacons. He was appointed by the leaders of the Church to distribute food and other necessities to the poor in the growing Christian community in Jerusalem, thereby giving the apostles more time for their public ministry of proclamation (Acts 6:2-5). He and the other deacons apparently were expected not only to wait on tables but also to teach and preach. When some of his colleagues became jealous of him, they brought Stephen to the Sanhedrin and falsely charged him with blaspheming against Moses (Acts 6:9-14). Stephen’s confession of faith, along with his rebuke of the members of the Sanhedrin for rejecting their Messiah and being responsible for His death, so infuriated them that they dragged him out of the city and stoned him to death. 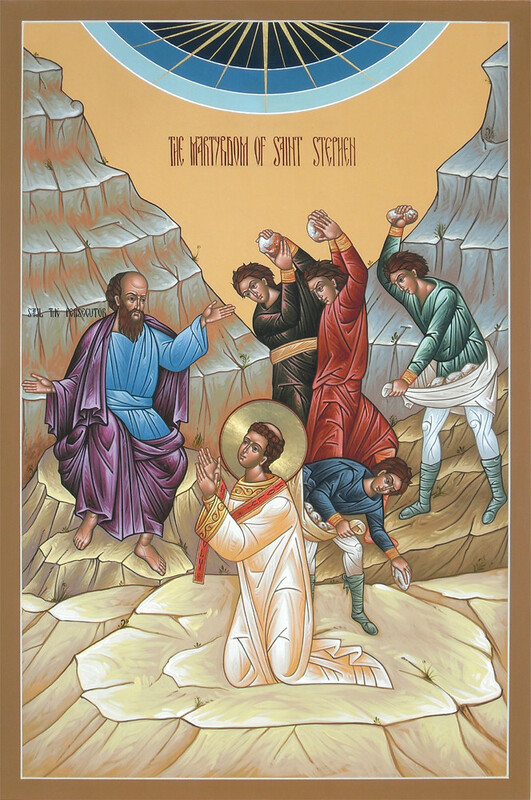 Stephen is honored as the Church’s first martyr and for his words of commendation and forgiveness as he lay dying: “Lord Jesus, receive my spirit” and “Lord, do not hold this sin against them” (Acts 7:59-60). Stephen means a “garland” or a “crown.” Think here of our beautiful Christmas consolation. Whoever believes in the name of Jesus is righteous before God and can expect a glorious crown. Devout Christians are “virgins” before God (Matthew 25:1; Revelation 14:4) and have four different virgin garlands. The first is the garland of righteousness gifted. Second is the garland of righteousness begun. The third is the garland of all kinds of cross and thorns. The fourth is the glorious garland of perfect righteousness.